How to Easily Master Format MOTOROLA MOTO C (PLUS) with Safety Hard Reset? Tips and tricks to fix MOTOROLA MOTO C (PLUS) troubles. This is cheap smartphone for users who would like to have 5 inches LCD screen. Both MOTOROLA MOTO C and MOTO C PLUS have similar specifications like 5 inches screen width, dual simcard slot, have same Android Nougat as factory default operating system, but some features have improvement at MOTOROLA MOTO C PLUS such as bigger RAM options 1 GB or 2 GB RAM, better main camera resolutions, and bigger battery. 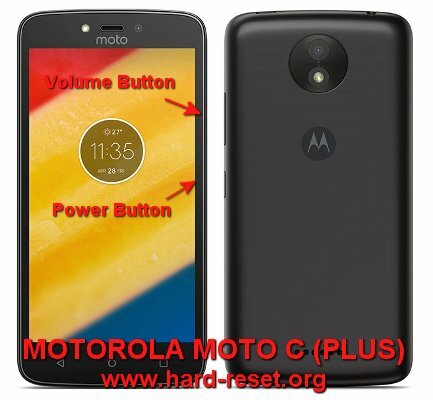 Find more information about how to solve problems of MOTOROLA MOTO C (PLUS) at www.hard-reset.org community. How to Unlock or Fix or Bypass or Solutions for MOTOROLA MOTO C (PLUS) forgot password code or security lock screen pattern or pin (lost password)? Although this phone is entry level smartphone, but we still can take good pictures with 8 megapixel main camera and 2 megapixel front camera. After using this phone for several months then we will have several personal pictures or video recording and some confidential important data. We have to give security protections to make all data inside MOTOROLA MOTO C (PLUS) safe when away from us or lost or stolen. Because this phone is cheap then MOTOROLA MOTO C (PLUS) does not have fingerprint sensor. But there are some other default option to secure our phone using screen lock pattern or password pin protections. We suggest to use screen lock pattern because it is easy and fast to open. The problems will be happen when we forgot security answer or can not open with finger scan, what should we do? Is That Any Secret Code for Doing Format MOTOROLA MOTO C (PLUS) ? There is no secret hidden code for MOTOROLA MOTO C (PLUS) to make it back to factory default. Do the options above to hard reset it. How to Format or Erase Phone Memory at MOTOROLA MOTO C (PLUS) ? There are two phone memory type at MOTOROLA MOTO C (PLUS), one is internal memory and the other one is external memory. If we want to format internal memory phone then we have to do hard reset or reformat the operating system of MOTOROLA MOTO C (PLUS) as well. Please use menu setting to do hard reset or reformat using #option 1 above, but make sure to give checkbox mark at Erase Internal SD card / Internal storage. Then it will reformat the factory default operating system and remove or erase any data inside internal memory. How to Make Battery of MOTOROLA MOTO C (PLUS) Stronger, Life Longer and Not Fast to Drain ? The MOTOROLA MOTO C PLUS version have more bigger battery capacity with 4000 mAh, while the standard version MOTOROLA MOTO C with Plus have only 2350 mAh battery, of course the PLUS version have more battery life for use one day without need to recharge, some users also can use MOTOROLA MOTO C PLUS about 2 days for standard usage. For MOTOROLA MOTO C, we suggest to do some adjustment to make battery life more longer or not fast to drain by doing some adjustment. First try to adjust LCD screen brightness as low as possible, because LCD will consume a lot of battery power capacity. Please disable all not use connection like GPS or Bluetooth or Wifi. If we need to use GPS for some applications, then please activate GPS battery saving mode which available from menu Setting > Location. The information from this page describe about How to reboot moto c,moto c factory reset,Moto c plus by. If you need another resource for hard reset, use search function at this homepage or find from our related posts. How to Easily Master Format XIAOMI MI NOTE 3 with Safety Hard Reset?